A gun blogger published test results that pretty much corroborated the concerns of the Dallas PD. The very next day, Sig released a statement offering a voluntary upgrade for users. 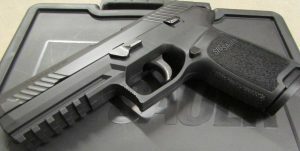 However, this offer of an upgrade may actually prove to be a costly mistake for Sig Sauer. Before coming up with this offer, the company was already facing a $7 million personal injury lawsuit filed by a Connecticut police officer who suffered bullet injuries to the knee and leg when his holstered pistol discharged after hitting the ground. The officer, Vicent Sheperis, is aged 34 and attached with the police station in Stamford, Connecticut and is a member of the city’s Special Response Team. He suffered injuries in January. The lawsuit has been filed in a New Haven federal court last week. The officer asserts that his injuries have resulted from a defective safety mechanism in the P320 and that this is a design defect. This purported defect in the gun’s design has been a topic of discussion among firearms enthusiasts. The lawsuit claims that “The weapon’s internal and external safeties all failed to prevent it from discharging and shooting Officer Sheperis,” and that the trigger “incapable of being touched or of any movement” because the gun was holstered. The lawsuit points out the Dallas police suspension of the weapon and 11 other cases involving the P320. The lawsuit was filed before the company offered the voluntary upgrade and according to Jeffery Bagnell, attorney for Sheperis, this move by Sig Sauer actually validates the lawsuit. The Sig P320 is also the handgun of choice for the U.S Army.